Summer Learning Program, June 1 - August 31, 2019. June 1 - August 31, 2019. For ages 0-18. 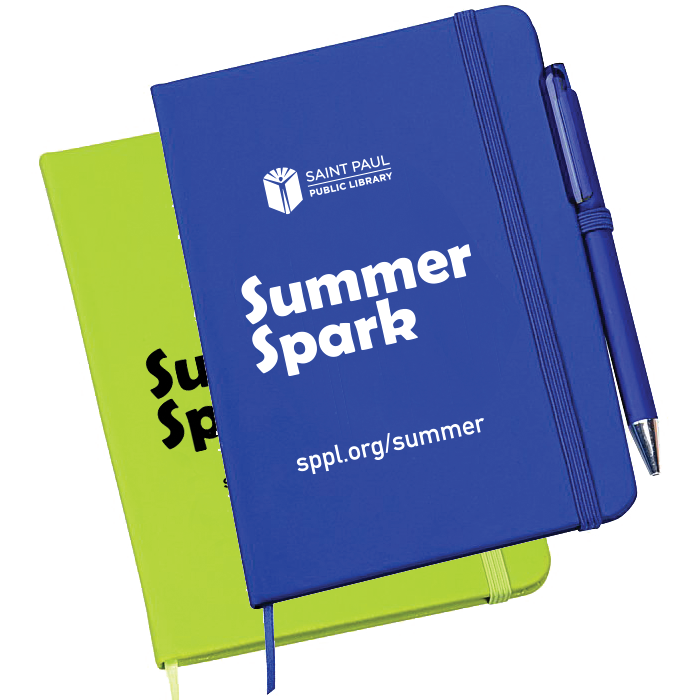 Summer Spark encourages kids to have fun, stay active, and keep learning all summer long. Join in the fun by attending free programs at your library and earning prizes by completing reading and activity challenges! Kids and teens can earn book prizes, journals, and a chance to spin our prize wheel in August. Earn one free book of your choosing! Earn one of these cool journals! Great Summer Experiences for the whole family! Your summer. Your choice. Read and rate books and earn great prizes. The latest Summer Spark news, resources, and more! Summer Spark and Como Park Zoo & Conservatory presents Penguins! at Riverview Library. Learn about Cupid, the African penguin. Read and rate books and enter to win a Nintendo Switch and three games of your choice! With the popularity of Black Panther, Afro-Futurism is hot right now. Take the next step with the compelling Afro-Fantasy. See the full list of Summer Experiences, including Spark Camps! Join in the fun as Dr. Tyronne E. Carter demonstrates some cool visual science experiments! Audience participation encouraged. “Ollie’s Garden”: Join Ollie the dog as he learns some new tricks and tries to protect the carrot patch from a pesky rabbit. "The Little Mermaid": A mystery under the sea? Join Ariel, King Triton as they try and teach the evil Ursula a lesson about bullying. Anishinabe artist, storyteller, and puppeteer performs in English and Spanish. From classical music to lively dance tunes, hand-crafted marionettes will entertain you with their own special talents. Wendy’s Wiggle Jiggle & Jam! Have a blast with music and movement in this fabulous interactive music program! Families will get to hear fun stories about Siama's rural childhood in DR Congo and dance, sing and play happy songs on percussion! “Big Ship Rockin’ On the Sea”: Rollicking songs, song games, and stories from Ireland, Scotland, and other lands across the sea. Get your family dancing to the rhythms of the banjo, guitar, autoharp, & more with this award-winning local band!